Amy Poehler is a gay rights activist, at least her character on Thursday's season premiere of NBC's Parks and Recreation is. 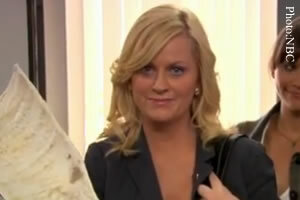 In the show, Poehler's character of Leslie Knope, an enthusiastic but incompetent government employee, inadvertently marries two male penguins at the Pawnee city zoo. The gay community rallies to her side as conservatives decry her actions and call for her resignation. The episode is likely inspired by the recent high-profile breakup of Harry and Pepper, the San Francisco Zoo's gay penguin couple. The pair called it quits this summer after six long years when Linda, the window penguin, won over Harry. The concept behind Poehler's political sitcom is derived from NBC's The Office. Both shows draw laughs at the expense of their stars who happen to be in over their heads – Knope for instance is a perpetually conflicted do-gooder leading an ultimately indifferent staff. Poehler came on board Parks and Recreation after starring in Saturday Night Live for seven years.